Bye Fat Hello Fit : Choose Brown Rice! I use to love eating white rice when I was younger. We'd have it as a side with dinner quite often. I'd load it up with butter and sugar, and eat tons of it mixed with my vegetables. Lol! I had no idea how unhealthy that was until I got older. I was later introduced to brown rice and other healthy grains like oats and quinoa. 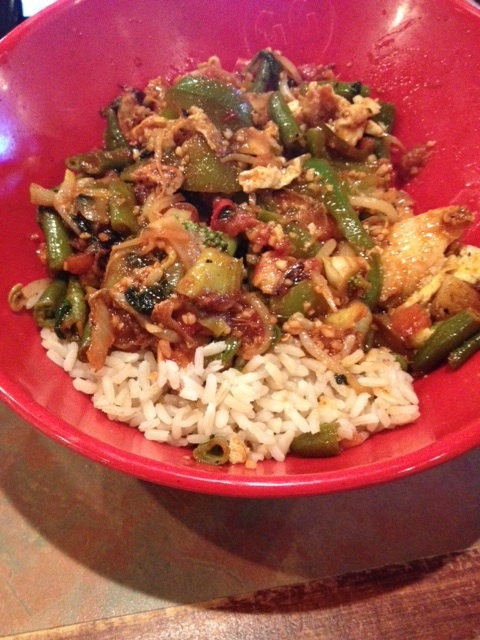 I love loading my Genghis bowl with vegetables and beans, and using brown rice as my my starch. Why do I choose brown rice over white rice? Well, white rice is stripped of its nutrients and eventually breaks down into sugar when it enters the body. This isn't good for insulin levels and can put you at risk for type 2 diabetes. Brown rice is actually a grain that is filled with nutrients like magnesium, copper, antioxidants and vitamin B. It has fiber and selenium that aids in the prevention of colon cancer. Eating brown rice is also great for weight loss, lowering cholesterol and cardiovascular health. These benefits are just too good to be true! All of this in brown rice? Yep, i'm hooked. Cheers to more servings of healthy brown rice!